gives body and substance to Oil paint causing it to dry faster. Also for cleaning brushes and equipment.
. 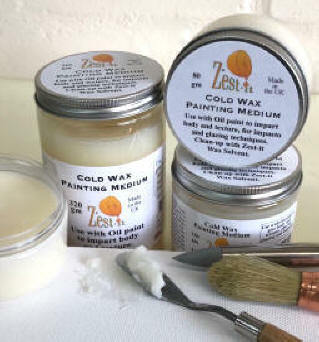 The Zest-it Cold Wax Painting Medium is a smooth, thick, firm paste and the reference to 'cold' is because it does not need or require heat. Use with brush, painting knife, shaper ,wedges or tools of your choice. Mix with Oil paint to give texture and add more substance to the oil paint, makes impasto easier to achieve and speeds the drying time. Use to add pigment, powdered metals, marble and other fine art materials to increase the visual depth and surface finish. Apply to canvas, mdf, gesso'ed panel, birch ply or material of your choice. It dried to a very cohesive and stable finish that can be 'varnished' with a coat of wax, just buffed with a soft cloth or left 'as is'. It does not contain any Aromatics or CFC's, it is classed as biodegradable and is therefore kinder to the environment. Sizes available - 80 gm; 150 gm; 320 gm; 840 gm. Check out the Absorbant Mat for use with Zest-it Brush Cleaners and Solvents, good for keeping the air quality in the work area cleaner. Please visit our Wax focused site at www.artywax.co.uk for more information on using the Cold Wax Painting Medium, different techniques, tools and surfaces, inspirations and ideas.